8th graders and parents are invited to WHS to learn about the freshmen academy and WHS. The freshmen teachers planned a wonderful informational night. 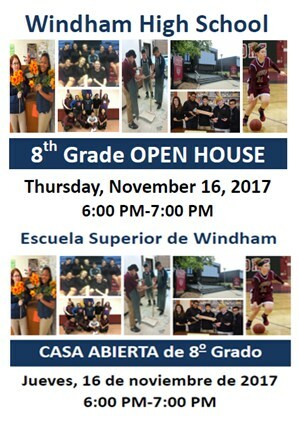 From 6:00-6:30 pm, there will be a fair in the cafeteria with tables hosted by students and teachers about our fall, winter, and spring sports, the freshmen academy and academics, a slide show of pictures from their recent field trip and activities, ECE and AP/Whips offerings, the Spain trip, NHS, yearbook, chess club, ECO, and information about our upcoming renovate like new project. The band will be playing music and will also have a table set up. From 6:30-6:50, there will be a slideshow about the freshmen academy in the auditorium followed by a panel discussion/Q and A with current freshmen. Then, everyone will be invited back to the cafeteria for snacks made by our culinary classes.